As Apple's music download service iTunes celebrates its first birthday, it has had a radical impact on the music industry. 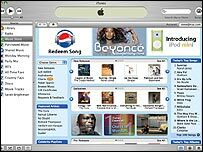 When Apple launched its online music store in the US on 28 April 2003, few could have predicted the impact it would have. But a year later, iTunes has helped transform the fortunes of the flagging global music industry, selling about 70 million songs and proving, once and for all, that there is a market for paid-for music online. "A year ago if anyone had predicted iTunes would sell 70 million songs in a single year we would have been laughed out of town," Apple chief executive Steve Jobs said on Wednesday. Last year the situation looked bleak for legitimate online services and dire for the music industry in general. Sales of CDs were falling sharply, with file-sharing programs such as Kazaa blamed for promoting piracy. The first major legitimate online services, Pressplay and MusicNet, backed by the big record labels, had launched with little or no impact. The services were stymied by a lack of big name artists, a poor pricing structure and the absence of that essential "cool" factor to appeal to the target audience of teenagers. They were also hamstrung by licensing deals which saw different record labels backing different services - it felt confusing to the consumer who simply wanted a one-stop shop for all his or her music needs. Apple's approach was different - it persuaded all of the major record labels to offer songs on its iTunes service. More than 700,000 songs are available in its online library, with more than 100,000 new tracks from independent artists and record labels. It is not known how exactly Apple persuaded the big record labels to throw in their lot with iTunes. Labels were still paranoid about online music, fearing that even legitimate services would lead to an increase in piracy. But Apple initially offered iTunes only to US owners of its Macintosh computers - who make up a tiny percentage of the PC global market. Record labels may have felt that offering music to such a small market presented few risks. Apple had dipped its toe into the digital music market a few years earlier, releasing its iPod music player. iTunes was designed as an engine for iPod sales, offering downloads which can only be played on the move on Apple's portable player, adding another layer of protection from piracy. The brand value of the iPod, combined with the reputation for innovation enjoyed by Apple and a 99 cents price point proved an irresistible mix - the company's tech-savvy users took to iTunes immediately. 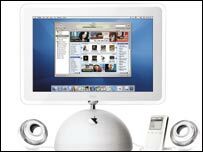 iTunes proved so successful that Apple was forced to widen the market - offering iTunes and iPods to PC users, dramatically increasing the numbers of potential customers. The record labels too could see it made perfect business sense because after many false starts, iTunes was proving to be the first genuine, legitimate service. The move proved inspired - iPod is now an essential part of the firm's business and in the last quarter Apple sold more of portable music players than it did computers. "It is the only seamless music experience in the world," said Jobs, highlighting the three components of the iTunes music player, music store and iPod. But iTunes has not had it all its own way. Apple's chief executive had boasted that iTunes would sell 100 million downloads in its first year, but it has fallen short at 70 million. Rival services, such as Napster, have launched in the US in the past year and the launch of iTunes in Europe has taken longer than anticipated. The service is now not expected to launch in Europe until the end of the year and Napster is pushing hard to launch in the territory first. In the UK, MyCokeMusic and services such as HMV and Virgin are beginning to get a foothold in the market with established brands. Apple's determination to stick with an audio format which only it uses, could also have long term consequences. An increasing number of download services, including those run by OD2, currently Europe's most popular online music site, use Microsoft's Windows WMA format, which cannot be played on Apple iPods. Apple's iTunes can convert WMA files to its own format, but not WMA files downloaded from music sites. The iPod has proved very popular in Europe and many owners feel frustrated that they cannot buy many songs online which will work on the device. There is also a wider concern for the industry. Despite the success of iTunes and Napster and a crackdown on online piracy, file-sharing of copied tracks remains a huge problem. According to a recent study, the number of US adults downloading music, most of it copied songs, has climbed by 27% during the past three months.